The following is a guest post by Erica Hill. My husband and I had a whirlwind romance. We met on a work incentive trip in Mexico. After a brief holiday romance, he went back to London and I to Washington, DC. Due to work travel I saw him a few times in London, and we were engaged within 5 months of meeting each other and planned our wedding to happen a year to the day we met. We had a 7 month engagement, which is not a lot of time to plan a wedding. We also had a very limited budget- our parents thought we were crazy, so we were on our own to pay for the wedding. Limited time and limited budget required creativity to put together a beautiful, yet affordable wedding. Finding a venue is the first step, because that dictates everything else. We had our wedding in London, so with venues costing a great deal of money, and limited availability with my notice, we opted to hold the wedding on a Monday – the discount was steep for picking an off day of the week. We paid a third of what it would normally cost to rent the space, and we were able to get a better room- one that would not have been available to us on a weekend because of our wedding size. We figured because more than half of the guests were travelling to attend the wedding, the day of the week was less important because they were taking time off of work anyway. We also had many retired family members, so the day of the week doesn’t matter to them. Having the wedding on a Monday had trickle down cost savings for all of our vendors. The cost savings was more than $15,000 based on the off day of the week. Now, this is not practical for everyone, or even a trade off many would be willing to make, but it’s worth considering. Because the wedding was the first time my family was meeting my husband to be and his family, we kept the guest list to immediate family and closest friends, so that we could spend quality time with everyone and make sure there was an opportunity to really meet and get to know each other. We were in our mid-twenties when we got married, so many friends were not married – so we did not extend a +1 invite unless it was a serious relationship. This is also a controversial decision, but we really wanted to create an intimate atmosphere based on our special friends and families since the wedding was quite sudden, and we wanted to blend our circles, rather than having ‘other’ people in the mix. Our wedding had 29 guests, a major cost savings! In the UK, there is a tradition to invite additional guests to a drinks reception after the dinner. We took advantage of this, and were able to include an extended group of friends, while at the same time not being tacky. This is probably not a good idea in the U.S, because it is not a social norm and could cause hurt feelings. We opted for a buffet dinner. The venue had lovely food, and because the wedding was so small, it did not have a cattle line feel at the buffet table- it also meant that people were not waiting long and everyone got to eat at the same time. This saved us quite a bit of money. We also provided wine and sparkling wine after the ceremony and through dinner. After dinner when additional guests arrived we had free wine, but anything else was a cash bar. Again, this is controversial, but this saved us thousands. If you didn’t want to get out your wallet, you could have wine. Wedding Cake: Wedding Cakes can be $1,000 easily, and sometimes even more. My mother-in-law is an excellent baker, and she baked our cake for us. 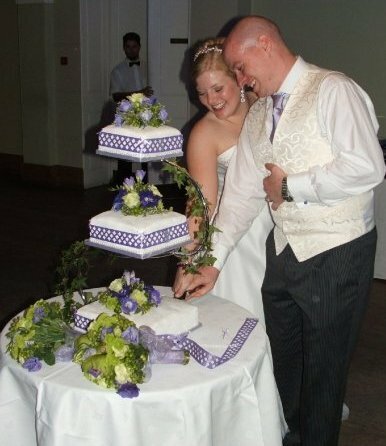 We had the florist trim the cake with flowers and ribbon, for a small fee. Tablescape and Flowers: We paid the florist to do the major arrangements and bouquets and boutonnieres, but family members made the table flowers and provided the extra touches such as candles, and table cards. We used simple wedding favors with candied almonds in tulle and ribbon. Doing the tables ourselves shaved another $1,000 off of the budget. When you pick a beautiful venue, you can get away with fewer flowers and decorations. Also, because we were a Monday wedding, the florist fees were much lower and we were able to negotiate for the best price. To provide an extra special touch to the ceremony, we hired a harpist. Rather than paying a professional, we hired a senior music student who had played for the royal family- and again because it was a Monday and she was a student, the fee was 25% of what hiring a professional would have been. Because we saved money in other places, I was able to pay for chair covers- which were not necessary, but something I really wanted. And because the wedding was so small, this cost was a fraction of what it could have been. I bought a dress off of the rack. I had my mother in law make the alterations required. My entire wedding ensemble including accessories was $1,000. There are many ways to save on the dress including: buying off of the rack and forgoing the designer dresses, buying used, or finding a good seamstress to copy a designer dress. I did splurge on a hair stylist for me and my family, but I did my own makeup. We had a beautiful, English garden wedding for less than half of what the average American wedding costs. And this was in one of the most expensive cities in the world. Think about what you absolutely want to have, and then how make tradeoffs to fit it into the budget. The tradeoffs were worth it in order to start our lives together without wedding debt. Erica Hill works with weddingfavors.org. After living with her husband in the U.K. for three years, she and her husband relocated to Denver, Colorado for their happily ever after. It’s been 8 years since the frugal wedding, and family and friends don’t think they are crazy any longer.